What would you give to be able to improve your existing codebase with complete safety? The Refactoring book completely changed the way I code. In 2001 while searching for information on design patterns, I discovered the original wiki, and stumbled on Extreme Programming. This led me to a software development conference in 2002 called SD West. 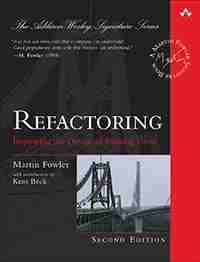 There I attended a session by Martin Fowler, and knew that I had to pick up his Refactoring book that day. How could I resist a book that promised to teach me about “improving the design of existing code”? Refactoring: Co-opted in the workplace? Many years later, I find the term “refactoring” being thrown around in the workplace, at company after company. Programmers and managers often talk about “refactoring,” when they mean “rewriting.” I’ve seen nightmares brought about by so-called “refactoring” that introduced so many defects, it compromised the product ship date. The Refactoring book, however, teaches a disciplined methodology of changing code in small steps, with automated verification of each step. Of the books I keep at work, a small handful are kept within easy reach for looking things up. This is one of those books. Each refactoring has a detailed recipe of its steps, and things go better when I open the book to follow those precise steps. refactoring.com is the web site companion for the book. Check out the list of refactorings to get a feel for what I mean when I call it a disciplined methodology. Watch my screencast Refactoring Demo: Is It More than Just Changing Stuff? When You Refactor, What If You Took Smaller Steps? Question: What has been your experience with refactoring? Leave a comment below. Finally received my copy of Refactoring. The hardcover somehow reminds me of the time I was in college.